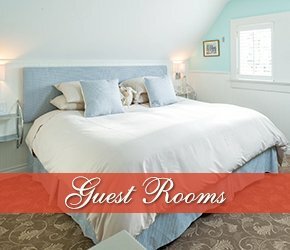 RECENTLY FEATURED ON GLOBAL TV AS TRIVAGOS' #14 TOP HOTEL TO STAY IN CANADA, Ranked the #1 B&B in Vancouver by Tripadvisor and featured as one of the Top 10 hotels in BC by Globe and Mail. So many must-see attractions within walking distance - the Cruise Ship Terminal and Canada Place, Shopping & Dining on Robson Street, the Vancouver Art Gallery, Theatre and Cinemas, transit, Stanley Park and the infamous seawall perfect for a leisurely stroll. Yet you’ll find us on a quiet side street between the true City Centre and the peaceful solitude of 1000 acre Stanley Park. We are happy to offer a discounted rate for those willing to pay up front in full for their reservation, which will make it NON REFUNDABLE. For more information please visit the rates page or click here! 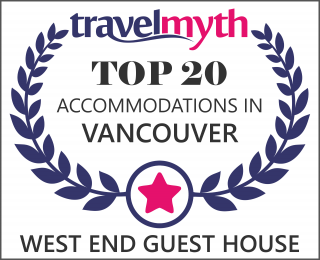 For nearly 30 years the West End Guest House has opened its doors to tourists, travelers, conference attendees, neighbours and friends. Each year extensive effort is taken to improve the Bed & Breakfast for our guests. Whether you are a single traveler, a couple, friends or family group, we have the perfect accommodation for you. 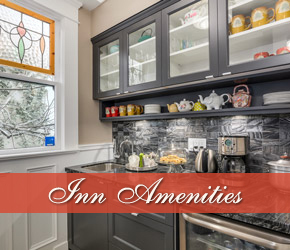 Built in 1906, our recently refurbished Heritage Registered Vancouver Inn has interior furnishings reminiscent of a by-gone time along with modern amenities such as refurbished ensuite bathrooms, a complimentary butlers pantry with refreshments and free wi-fi. A hall gallery of old photos of Vancouver, taken by the son of the first owner of the house "Edwards Family" remind us of how modern Vancouver has become without having lost its charm. Vancouver is known for its conference facilities, if you are attending meetings in Vancouver please call for a convention or corporate rate. Harking back to the days when the West End was Vancouver’s first residential neighbourhood, the 1906-built West End Guest House was once home to the Edwards family – some of their photographs of early Vancouver adorn the walls. Current owners Paul Wylie and David Birch have modernised the interiors and plumbing (all rooms are en suite), while retaining a period charm. The eight individually styled and named guest suites range from lush garden level (Superior King Garden Suite) to cosy top floor (Deluxe king Suite). Complimentary gourmet breakfasts, and free Wi-Fi add to the charm. It is on historic Haro Street, with easy access to the nearby Stanley Park seawall, or Davie and Robson Street shopping areas. The parlour with hearth is ideal for winter contemplation, while the veranda and garden beckon in summer months. "I love this place and wish I'd found it sooner"
I had a fantastic time at this warm, welcoming, and wonderful establishment (You can see why it's rated #1). In fact, the place is so great i wrote a poem about it. "An Ode to the West End Guest House"
Although you might be a world traveler, your life is not complete until you've been to the West End Guest House on Historic Haro Street. The Place is filled with antiques and there's Mozart on the wall. 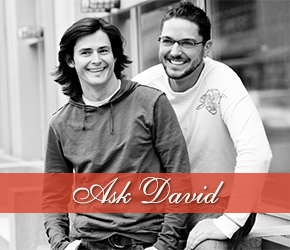 You will be treated like your royalty by David and by Paul. You will enjoy delicious breakfasts served in splendid company. And you'll have muffins or cookies with a cup of herbal tea. The spirits of the Edward's clan smile on it from above because two gentlemen with taste and class restored their home with love. "This is truly a wonderful B&B. We enjoyed our time here & the wonderful hospitality. The breakfasts were amazing as well as the company. Thank you so much for a great stay." "A true West End Gem"
Upon our arrival we were warmly greeted by Paul & David and as we entered we stepped over the threshold into another time. The walls adorned with rich history captivated me as we made our way to our 3rd floor luxury room peppered with personal touches it felt so comfortable clean and welcoming. We joined our fun hosts for a drink in the living room. A fun event that i will not forget soon. Oh Sherry! For breakfast David prepared a delightful 3 course, which included, a favorite of mine, How did he know !!? 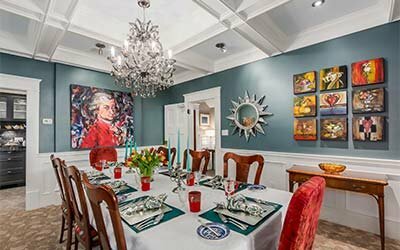 We we were luck enough to catch a glimpse of the space before they embarked on a small cosmetic reno to imprint their new journey within the house. Congratulations Paul & David I can not wait to return to enjoy your interpretation of the West End Guest House.